What can I expect when travelling in Morocco? How do I get there? What airlines fly to Morocco? How much mountaineering experience do I need in order to climb Mt. Toubkal? What type of clothing should I wear in Morocco? What kind of food do Moroccans eat? What should I wear and bring on a camel trek? How will I charge my electronics in Morocco? What vaccinations do I need to travel to Morocco? What is shopping like in Morocco? What is a hammam and do you recommend we try one? How much money/ what type of currency should we need to bring? 1. What can I expect when travelling in Morocco? Morocco is a remarkable country. It offers wilderness that is quite distinct from anywhere else. Morocco’s economy is based on tourism; with the diversity of landscape, welcoming locals, ancient architecture, delicious food and incredible trekking, it is easy to understand why is such a great destination. 2. What is the capital of Morocco? The Capital of Morocco is Rabat, located on the Atlantic Ocean. Over 2 million people live in the city, which makes Rabat the second largest city in Morocco. The largest is Casablanca. 3. How do I get there? What airlines fly to Morocco? Morocco is easily accessible from most European and northern American countries. Most major airlines operate service to/from Morocco. Popular airlines include: KLM, Lufthansa, American Airlines, Royal Air Maroc, Iberia, Air France, British Airways. 4. Do I need a visa for Morocco? No visa is required for travelers of most nationalities. 5. How much mountaineering experience do I need in order to climb Mt. Toubkal? 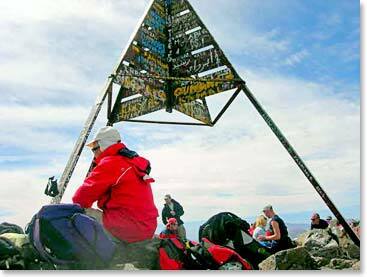 To climb Mount Toubkal (13,671ft/4,166m) no prior mountaineering experience is necessary. Your guides will help you prepare for summit day by discussing proper technique and telling you what to expect on the mountain. The ascent is not technical; expect some snow and rocky terrain. Mount Toubkal is a suitable climb for people of any age. Having good cardiovascular conditioning and strong hiking muscles will make the trip more enjoyable. 6. When is the best time of year to visit Morocco? 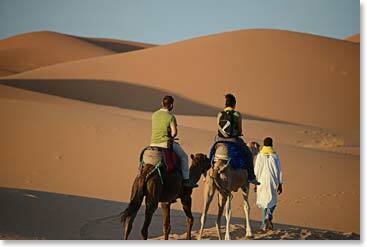 Popular times for travel to Morocco are typically March to May and September to November. This is usually when the weather is warm but not too hot for sightseeing and other activities. 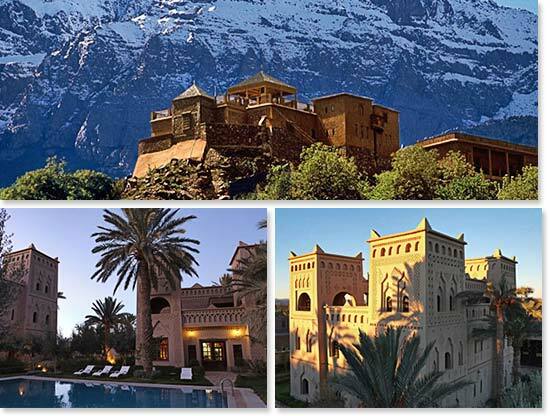 If you wish to travel with Berg Adventures on a private trip to Morocco, please contact our office. 7. Which kind of weather should I be expecting? We will be traveling throughout diverse parts of Morocco; the Atlantic Coast, the Atlas Mountains and the Sahara Desert; needless to say, you’re going to experience a variety of weather conditions. Located near the Atlas Mountains, the weather in Fes is always changing. Average temperatures in October are a high of 77̊F/25̊C and 54̊F/12̊C. Temperatures begin to decline in October in Marrakech, but only slightly. The highs are usually around 81̊F/27̊C and the lows are 59̊F/15̊C. Both Fes and Marrakech see plenty of sunshine during the day with cooler evening temperatures in the fall months. In the mountains you should also expect the weather to be shifting constantly. The fall season in Morocco is perhaps the best season to take advantage of the mountain regions as the temperatures are cooler than those in the hot dry summers. This makes for great trekking weather, but be prepared for possible rain and snow up in the mountains. Consult our gear lists to be best prepared for your trek. 8. What type of clothing should I wear in Morocco? In the cities you will be comfortable in casual clothing. For your climb you will want to prepare with clothing suitable for changing mountain temperatures. When packing, think about bringing clothes that are versatile and easy to layer. Consult our gear list for more information and good tips on clothing and gear. 9. What kind of food do Moroccans eat? In Morocco you will find a large selection of Mediterranean and tropical fruits and vegetables. You will see traditional dishes made with beef, lamb, chicken, rabbit and seafood. All of these are commonly cooked into stews, soups, on skewers or with rice and vegetables. 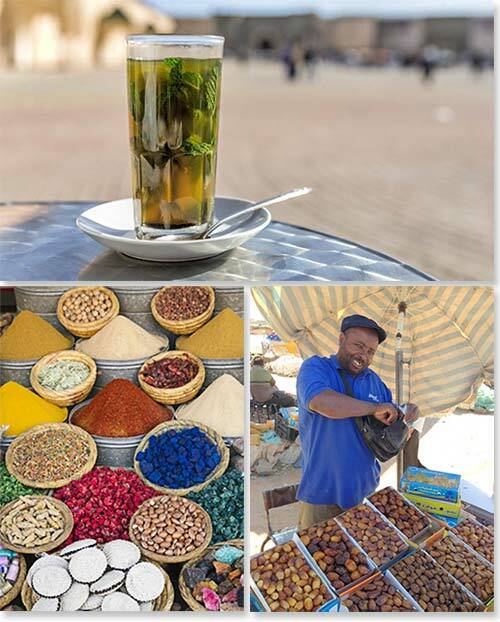 Tea, especially mint tea, is very important to the Moroccan culture. The serving of mint tea can take a ceremonial form and is typically prepared by the head of the household for every visitor. 10. What is the accommodation like? Can I request a single room? As with all of our trips, we stay in first class accommodations whenever possible. 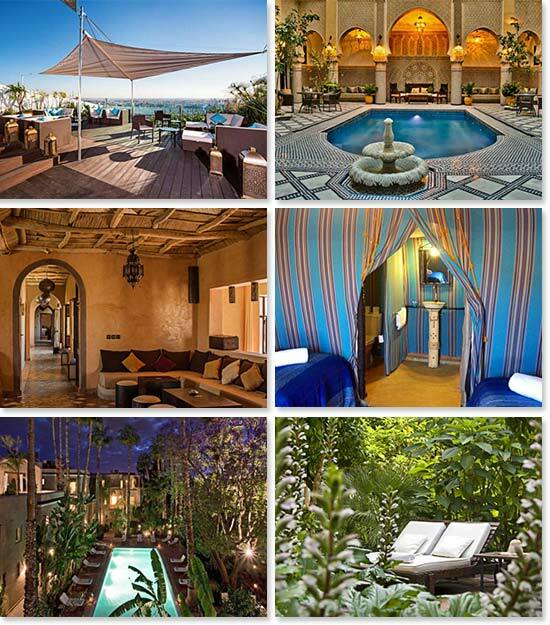 In Casablanca, Fes, Marrakech and in the cities bordering the dunes, we stay in charming hotels and Riads. When we move into the desert we will sleep in a tented camp. As we go through the Atlas Mountains to climb Mount Toubkal we will enter Toubkal National Park. We spend the night at a beautiful Kasbah before the climb. During the climb our home base will be a refuge/hut called Neltner. Double occupancy accommodation is included in the trip cost. Single rooms are available at an additional cost. If you are traveling alone but would like a double room, we will do our best to pair you with another person of the same gender. In the event that we are unable to find a roommate for you, we will split the single supplement cost with you. Contact our office for single supplement prices. 11. What is a Kasbah? Kasbah meant a place where the local leader used to live; it was usually built on hilltops, had high walls in order to defend the village if under attack. The design is similar to a fortress, high walls and no windows. 12. What should I wear and bring on a camel trek? A lightweight, long-sleeved shirt is an important piece of clothing. Bandanas are extremely practical as they can be used for coverage from the sun, protection from blowing sand, and are also great for cleaning sunglasses. Sun screen, sunglasses, hats, water bottle and a small day pack will be useful while on your camel trek. A camel ride through the dessert is a once in a lifetime experience! 13. How will I charge my electronics in Morocco? 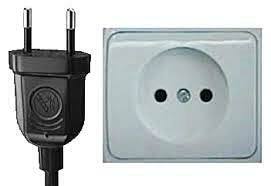 In Morocco, the standard voltage is 220V, 50 Hz and the outlets are generally round with two pins. You will probably need to use an adapter for your electronics. Some chargers, especially for laptops and mobiles, have converters built in. Always check your electronics to make sure they can handle 220V volts before attempting to charge them without a converter. You will find type C electrical outlets in Morocco. 14. Will I have internet access? Can I use my cell phone? You will have internet access in most of the hotels and Riads we stay at, check the front desk for additional charges if applicable. Mobile coverage is widespread in Morocco. Local SIM cards and Pay-as-you-go cards are available in many shops and kiosks. Using a local SIM card is often much cheaper than roaming services, but will require that you have an “unlocked” phone with a removable SIM card. Be sure to call your service provider before using your cell phone abroad. 15. What vaccinations do I need to travel to Morocco? Currently there are no official vaccination requirements for Morocco. However it is recommended that travelers be up to date with their hepatitis A, typhoid, tetanus and other routine vaccinations. Consult a travel clinic for the latest recommendations. 16. Can I drink tap water, is it safe? It is recommended you do not drink tap water anywhere in Morocco. Bottled water is available everywhere for a very reasonable price. We also recommend you bring your own purification tablets. 17. What is shopping like in Morocco? Souks or bazaars (open air markets) are found throughout Morocco. It is common practice to negotiate the price and they rarely have a fixed price. Have a price in mind before you start the negotiations and try to keep to it. You are always free to walk away from anyone who is not giving you a reasonable offer and sometimes that will make them lower theirs. However it is usually considered bad practice to spend a long time interested in an item if you have no intention of purchasing it. In Morocco you can expect to find beautiful pottery and ceramics, carpets, silver jewelry, scarves, and high-quality leather goods. 18. What is a hammam and do you recommend we try one? It is highly recommended that travelers to Morocco experience a traditional hammam. The hammam is a ritual in a heated room that includes a deep cleaning bath. You can find these in private spas or in many of the Riads. Most public hammams are attached to a mosque and it is a ritual locals partake in at least once a week. 19. What language is spoken in Morocco? A number of different languages are spoken in Morocco. The two official languages are Arabic and Berber. French is considered the third official language. 20. How much money/ what type of currency should we need to bring? The Moroccan currency is the Dirham (MAD). There will be ATMs in the larger cities and most towns we visit. If you are brining cash be sure to bring newer/undamaged bills. Some places will not accept ripped or older bills.